Finding a suitable tankmate for your betta isn’t always the easiest task in the world. Too aggressive and they’ll fight each other. But if they’re too peaceful your betta may pick on them. Also if they’re too colorful then they may end up getting attacked. However, why not try keeping dwarf crayfish and bettas together! There are circumstances where it’s definitely possible to keep dwarf crayfish and bettas together! Keep reading to find out how it can be done. 9 So Can You Keep Dwarf Crayfish And Bettas Together? 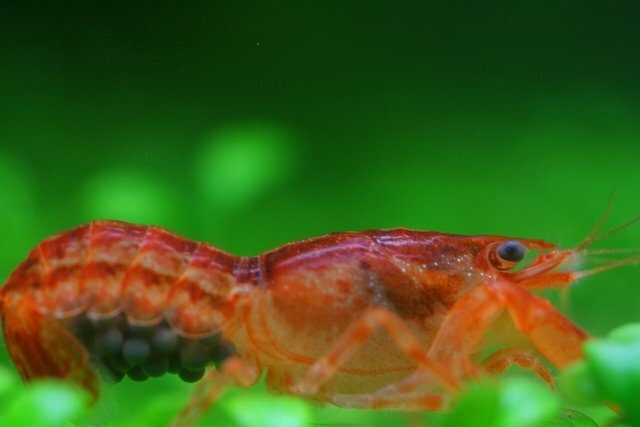 Before you decide to introduce dwarf crayfish into your tank, there’s a lot of information you’re going to need to know. And it’s also important to remember that when it comes to bettas, there’s no tank mate that’s 100% compatible. Most of the time the only thing that’s going to decide whether your betta will fight or not is his own temperament. So if you’ve never housed other tank mates with your betta before you’re really rolling the dice. However, if you know your betta has a peaceful temperament (as much as a betta can have one) then keep reading! If you’re keeping dwarf crayfish and bettas together it’s important that you set the tank up correctly. The problem isn’t going to be with your dwarf crayfish but with your betta. Here are some ways you can limit the chances of your betta attacking your dwarf crayfish. Make sure you have a lot of hiding places for your crayfish. Giving them lots of places to hide will reduce the chance of your betta attacking them. They will also need these hiding places when they molt and they’re at their most vulnerable. As well as this, the bigger the tank the less likely your betta will want to attack your dwarf crayfish. Especially if you have a tank with a lot of height. And of course, make sure you’re definitely buying the right type of dwarf crayfish. You should only be buying the Cambarellus species. They are peaceful and non-hostile. If you buy bigger crayfish they may end up attacking your betta. Now that you know the steps you’ll need to take to give your dwarf crayfish and betta the best chance of living together, here’s some more information about dwarf crayfish. Luckily dwarf crayfish and bettas are going to need similar habitats. If you just leave them in an empty barren tank they’ll quickly become stressed. In the wild, dwarf crayfish live in lakes, streams and slow flowing rivers. Whereas bettas like to live in rice paddies, water basins, and slow flowing rivers. So make sure your filter produces a slow, gentle current in your tank. Make sure it’s not too strong or your betta will become stressed. But also make sure it’s not too weak or it won’t aerate your tank enough and your crayfish will suffocate. If you’re worried you can also add a bubbler to your tank which won’t upset your betta and will give your crayfish enough oxygen! Most importantly, when setting up your tank make sure you add a lot of hiding places. For the happiness of your dwarf crayfish and betta, you should add a lot of live plants. As well as that, make sure there’s plenty of driftwood and caves that your crayfish and betta can hide in. Java moss is a great plant you can add to your tank which will give your dwarf crayfish places to hide. You should also check out hornwort and anacharis as well! And lastly, your substrate should either be sand or very small fine pebbles. Your dwarf crayfish are going to be spending their whole lives on the substrate you want something that will be comfortable for them. If you get pebbles that are too large or sharp your crayfish might cut themselves on it. And if the pebbles are too big they may also get their legs trapped in between the gaps. When housing a betta and dwarf crayfish together you’re also going to want to make sure the water conditions are right. Luckily the parameters dwarf crayfish and bettas need to survive are very similar. Dwarf crayfish need a pH level between 6.5 – 8 and bettas need a pH as close to 7 as possible. However, if you have to choose between a more alkaline pH (7 or higher) or a more acidic pH (7 or lower) you should aim for the more acidic pH, as your betta will prefer it. Just make sure it doesn’t fall below 6.5. Next is the water temperature. Bettas love water that is 78°F, however, anything between 76-80°F is suitable for bettas. Dwarf crayfish are a lot more hardy when it comes to water temperature. They can survive in water between 65-80°F. So as long as the temperature is good enough for your betta it’s going to be good enough for your crayfish as well. One thing you need to make sure of when caring for dwarf crayfish is the quality of the water. If there is too much ammonia or nitrite in the water then it’s going to become fatal extremely quickly. That’s why you should be performing water changes in your tank every week or so. (It all depends on the size of your tank as well as how stocked it is). It’s important to make sure your dwarf crayfish are getting all the required nutrients so you should purposely be feeding them specialized food. Hikari Crab Cuisine is a great food source for your dwarf crayfish and when it’s combined with other sources of food your crayfish is going to get all the nutrients it requires. You should also feed your dwarf crayfish and betta live food every so often as a treat. Daphnia, bloodworms, mosquito larvae and brine shrimp are all great choices. However, make sure you’re feeding them a balanced diet otherwise they’ll become unhealthy. As long as your feeding your betta and dwarf crayfish their required foods, then they will stay healthy and happy. And remember even though your dwarf crayfish is a scavenger you should still make sure you’re feeding them food that will nourish them. You already know that bettas often have an aggressive temperament, so it’s important to pick tank mates that cater to this. You need to find a tank mate that’s peaceful but won’t take being bullied. And while dwarf crayfish are small they definitely fit in this category. When you approach your tank you may notice your dwarf crayfish raise his claws to show he’s not afraid. It’s incredibly cute, but it will also help scare off your betta if he tries anything. However, because of their small size, they’re not going to do any damage to your betta, and they’re more likely to run and hide than attack. (If you do notice your betta constantly attacking your dwarf crayfish you will have to remove them from the tank and place them in another one, however). If you plan on keeping more than one dwarf crayfish with your betta then make sure your tank is big enough. Luckily one dwarf crayfish and one betta can live in a 5-gallon tank together (A great tank for dwarf crayfish and bettas is the Fluval Spec 5 Gallon). But if you plan on having more than one you’re going to need a lot of extra space. Dwarf crayfish are very territorial and if your tank is too small they’ll end up fighting each other. The fights are never serious and they are great too watch. You’ll notice them walking towards each other with their pincers raised, before jumping back! Remember, your dwarf crayfish are going to molt as well. So, don’t panic straight away if you think your crayfish is dead. It might just be an old shell that it’s shed. They are most vulnerable when they’ve shed their shell so it’s important you give them places to hide. Also, if you notice your dwarf crayfish aren’t molting then you should check the water parameters. The chances are there’ll be something wrong with the water making them unable to molt. If they don’t molt often enough they will die, so it should be a priority if you notice it’s not happening. Make sure you go to a reputable store before buying dwarf crayfish. The last thing you want to do is buy a dwarf crayfish that is carrying a lot of diseases, which could potentially infect your whole tank. 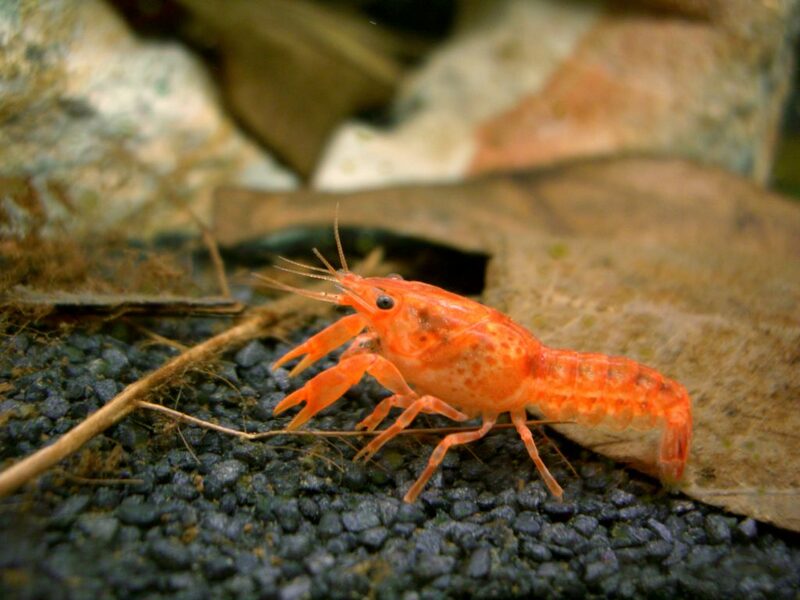 A healthy dwarf crayfish will be active and alert, as well as being brightly colored. You may notice that they’re missing limbs, but don’t worry too much about that. Their limbs will grow back and they could’ve been lost for a number of reasons. If you notice other fish in the tank look sick or especially if they’re dead, you should avoid buying anything from the tank and look somewhere else instead. 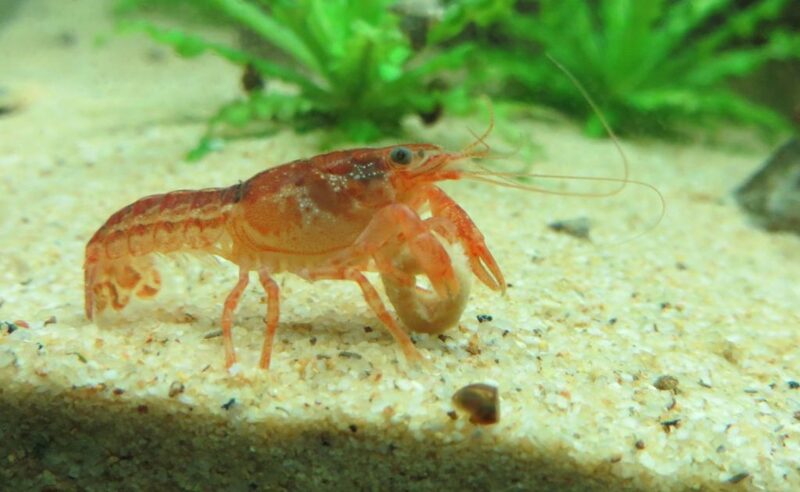 Dwarf crayfish are going to grow to a maximum size of around 2 inches. But remember, even though they’re small they’re territorial, so if you plan on having more than one in a tank you’re going to need to give them lots of space. Secondly, unfortunately, a dwarf crayfish doesn’t have a very long lifespan. On average they live for 1.5-2 years. So it’s entirely possible that you could buy a crayfish that’s already a year old and may only live for 5 or 6 months in your tank before it dies. So Can You Keep Dwarf Crayfish And Bettas Together? If you’re planning on keeping dwarf crayfish and bettas together then you should definitely go for it! Just remember, that no matter how much you set your tank up for success, if your betta has a particularly aggressive temperament then it won’t work. And the chances are no tank mate will be safe either. Your dwarf crayfish will need a lot of places to hide, especially when they molt. If you want to reduce the chance of your betta attacking your dwarf crayfish buy a tank with a lot of height. Your tank should be filled with live plants, driftwood, and other decorations. It should also have a slow flowing current. Even though crayfish are scavengers you still need to make sure they’re getting enough nutrition. You should feed them food specifically designed for them. When purchasing a dwarf crayfish make sure they are healthy. They should look active and brightly colored. Don’t worry too much about any missing limbs. 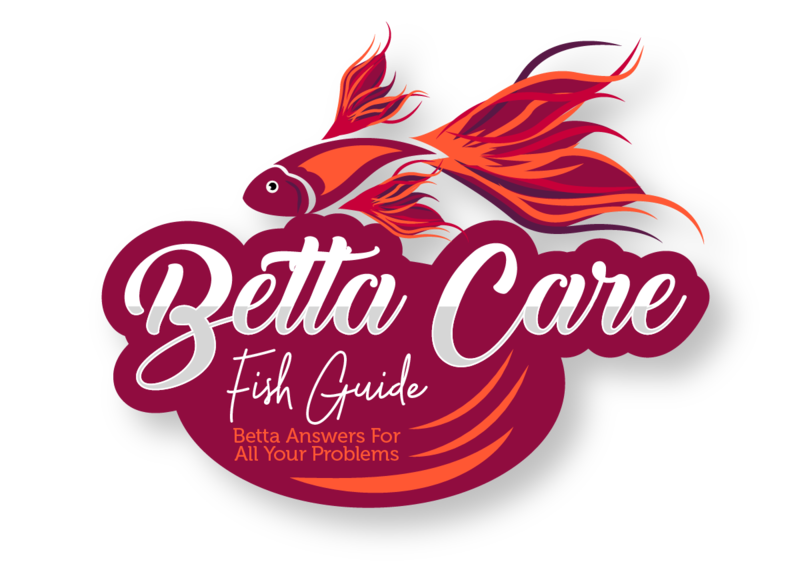 Redtail Sharks – If you’ve got a large community tank already, or you’re thinking of buying one then you may be able to keep a redtail shark with your betta. If the conditions are right and the tank is large enough, they can coexist peacefully. Corydora Catfish – Corydora catfish are very close to being the ideal tankmate for bettas. They remain at the bottom of the tank whereas bettas will stick to the top. They aren’t brightly colored and they’re not going to compete for food. Otocinclus Catfish – You may have noticed a running theme here. Catfish make excellent tank mates for bettas because they’re not brightly colored and they keep out of your bettas way.